This entry was posted in Full-timing, Safety, Traveling and tagged bottled water, Brita filter, clean tank, drinking water, potable water, RO water, sediment filter, water quality, water tank, water treatment. Bookmark the permalink. Wonderful article on methods of safe water storage. Having lived on a sailboat for many years in the Caribbean, safe fresh water is critical. This sounds like a lot of trouble. What I have been doing for three years now with no problems at all is use the water in my fresh water tank and then refill every time I stop. If we are going to sit for more than a few weeks, I put this a shot of this product http://www.3rodorcon.com/id21.html in my tank. 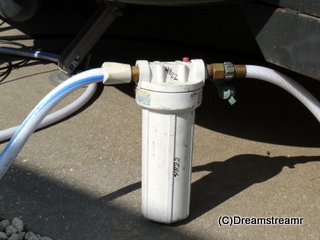 I always refill without a filter that removes chlorine, so we have benefit of that in the tank. For drinking, making ice, coffee, or tea, we run it through the filter in the kitchen sink faucet, and we change our filters every year. This is a trick I learned from the experienced WBCCI caravaners. It’s been working for us with no fuss.